Prestashop DropShipping : With our Prestashop Aliexpress Dropshipping Module, The admin can import products and their combinations from AliExpress into his prestashop store and can start selling those products within his own store very easily without having to stock the products physically. Once the Order has been placed on Prestashop, Awesome Order Automation process helps you to place order on Aliexpress on a single click ! Important Note : Click here to download the Chrome extension. Prestashop AliExpress Dropshipping- Drop shipping is an ecommerce business model that allows you to sell products from your store without investing capital in inventory. 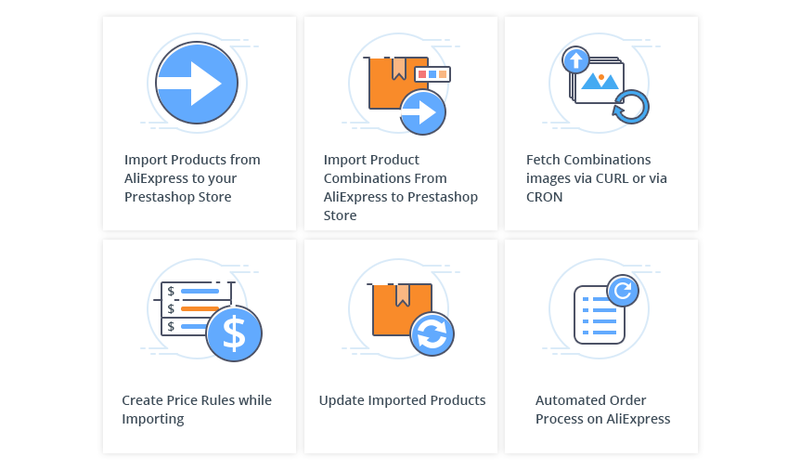 With our Prestashop AliExpress Dropshipping Module, The admin can import products and their combinations from AliExpress into his prestashop store and can start selling those products within his own store very easily without having to stock the products physically. Once the Order has been placed on Prestashop, Awesome Order Automation process helps you to place order on AliExpress on a single click !. Note : Click here to download the Chrome extension. Admin has 4 varied options to select the pricing mechanism of the newly imported product. -Same as AliExpress , Set Custom Price of newly imported product, Add Increased/ Decreased Impact on the products price when imported from Aliexpress. Admin can now import product on prestashop from both product page and category page. Product can automatically get create in prestashop catalog when sync from AliExpress, If "create product automatically" enabled by admin. Admin can pre decide the carriers to applied on the newly imported product. 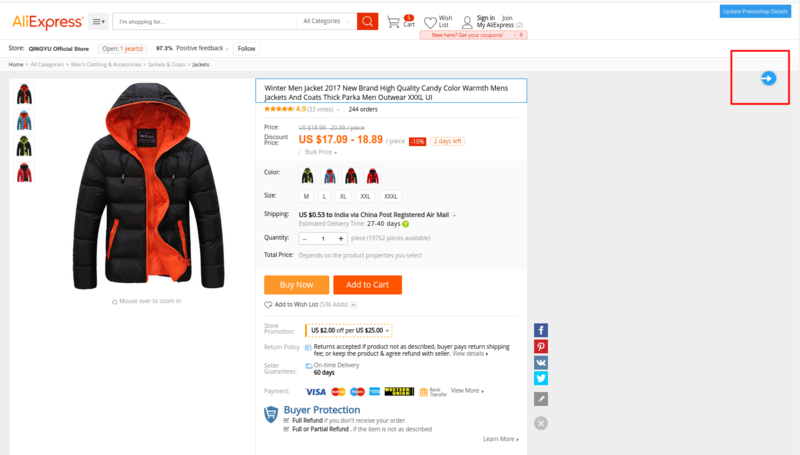 Admin can decide whether to add product images with the combination product images of the imported products on AliExpress end or not under "Product Combination image setting". If disabled by admin, only selected combination images with combination product will be displayed. Admin can automatically update product quantity and price of the imported products when they are updated on AliExpress end by "Cron task manager" or setting "Cron as per sspecific time interval". The admin can easily import products from AliExpress into his Prestashop web store and can start selling those products. The admin just has to install an extension for the Chrome browser that enables an import button on all the AliExpress products. The icon can be seen on all the product pages of AliExpress. Note: A custom built Prestashop AliExpress Product Importer Chrome Browser Extension on your Google Chrome browser for importing the products to your Prestashop store. When the products that are imported from AliExpress are purchased at your prestashop store, then all those orders will be visible under the AliExpress Orders section. The admin just needs to click the “Place Order” button and the admin will be redirected to the AliExpress website. After that the admin just has to enter the payment information as rest of the steps have been automated. This is a very crucial part as admin needs to set the default settings of the product being imported from AliExpress. There are various things that needs to be defined when product is being imported from AliExpress. Create product in Catalog – Admin can decide whether he wants to create the imported product in catalog when synced from Aliexpress. Product Status – Admin can decide if he wants to enable the product or not. Admin can fetch product details like Product Features, Product description, Product packaging and Product combination by setting "additional info setting" to "by Curl" or "by Cron"
Dispaly Packaging – Packaging details will be displayed on product page if imported from AliExpress. Display AliExpress Shipping Time – AliExpress shipping time will be displayed on product page if shipping time is imported from AliExpress. Associated Categories – Admin selects the The default categories associated with the newly imported product. Default Category – Admin pre-decides the default category with the newly imported product. Condition – Admin pre-decides the default Condition of the newly imported product – Old, New or Refurbished. Visibility – Admin pre-decides the default visibility option of the newly imported product – Everywhere, Catalog Only, Search Only OR Nowhere. Supplier – Admin can select the default prestashop supplier of the newly imported product. Options – Set default Options for the newly imported product – Available for order, Show price, Online only (not sold in your retail store). Tax rule – Admin can select the default prestashop tax rule for the newly imported product. Carriers – Admin can select the prestashop carriers available for newly imported product. When Product is imported from AliExpress to Prestashop, it is a major challenge to manage pricing. To do this we have our Product Price Settings section is the module configuration. Sometimes on AliExpress prices are set at a particular range. So, there is a choice for the admin where he can select whether he want product’s Minimum Price or Maximum Price to be imported on Prestashop. Also, There are Four options to select the pricing mechanism of the newly imported product. Same as AliExpress – Here the product price will be same on prestashop end as it was on AliExpress. Custom Price – Here Admin can set an altogether new custom price for the newly imported product. Increase – Here Admin can choose to add an increased impact on AliExpress price when product is imported on Prestashop. (Impact will be set in percentage form). Admin also has Product Combination Image Settings section in the module configuration. From here Admin can decide whether to add product images with the combination product images of the Imported Products on AliExpress end or not. If disabled only selected combination images with combination product will be displayed. Admin has Quantity Update Settings section in the module configuration. From here Admin can automatically Update Product quantity of the Imported Products when they are updated on AliExpress end by using the "cron task manager" module or by setting "cron as per specific time interval". Admin also has Product Update Settings section in the module configuration. From here Admin can Update Product information of the Imported Products when they are updated on AliExpress end. Admin also has an option to select which parameters will be updated. Options available at Admin end are Product Name, Product Price, Product Images, Product Features, Product Description, Product Packaging Details. Regenerate Product Combinations - Admin decides whether combinations of the imported product will be regenerated at prestashop end. While regenerating combinations the old quantity is lost. Note : If admin regenerate product combinations then there will be no stock management for all pending orders. Did you buy Prestashop Aliexpress Dropshipping? thanks for your help and for this module development. Exactly what I'm looking for. The best that I can find in the market. Very smooth. The best and excellent assistance on the web.